Spotted towhee's main diet is seeds but they also eat insects and fruit. They eat insects including ground beetles, weevils, ladybugs, darkling beetles, click beetles, wood-boring beetles, crickets, grasshoppers, caterpillars, moths, bees, and wasps. They also eat acorns, berries, and seeds including buckwheat, thistle, raspberry, blackberry, poison oak, sumac, nightshade, chickweed, and crops such as oats, wheat, corn, and cherries. In fall and winter, these plant foods make up the majority of their diet. the ground by kicking both feet backward at the same time to uncover food. towhees may search for seeds fallen, or sprinkled on the ground. Having a seed cylinder with mealworms and berries is a good way to attract these birds to your yard. In the Truckee Meadows and surrounding areas, look for spotted towhees in open, shrubby habitat with thick undergrowth. 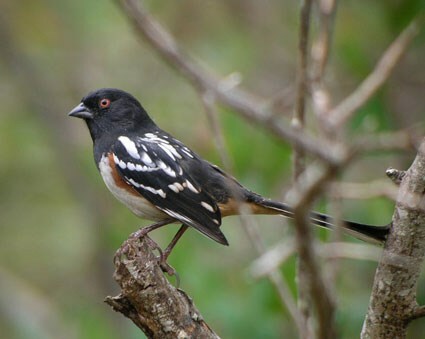 Spotted Towhees are also at home in backyards, forest edges, and overgrown fields. Their warm rufous flanks match the dry leaves they spend their time hopping around in. The birds can be hard to see in the leaf litter, so your best chance for an unobstructed look at this bird may be in the spring, when males climb into the shrub tops to sing their buzzy songs. Their song is a long buzzy chweeee. In some areas the bird is called a chewink because of the sound of their alarm. Other sounds are shenk, chup-chup zedededee, and a cat-like meew call. 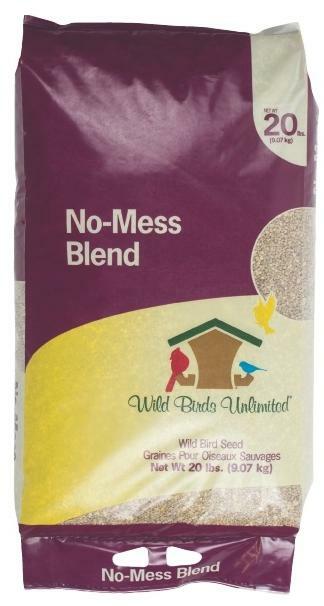 Our unique No-Mess Blend is a tidy feeding solution that is perfect for attracting a wide variety of birds. It features seeds without shells and is especially great near flower beds, patios and decks. Pound for pound, our No-Mess Blend is the best value because you do not pay for uneaten seed waste. The birds eat everything. Bark Butter Spread or Bits for winter feeding. No bird food attracts more species of birds than Jim's Birdacious® Bark Butter®. Created by Jim Carpenter, founder of Wild Birds Unlimited, Bark Butter is a spreadable suet that can be easily smeared on tree bark or a Bark Butter Feeder. Bark Butter® Bits are bite-sized nuggets made from suet and other high-quality ingredients your birds will love. Will attract a variety of birds, including many that do not normally visit feeders. Now in Hot Pepper varieties also! The Tahoe Big Year is upon us! Join the TINS staff on the first Tahoe Big Year outing as we explore the Tahoe Keys for waterfowl of all types. We will make our way through Cove East and if we have time, head over to explore Pope Marsh. Make sure to take notes, because this walk is sure to reveal new birds for the Big Year. * Watch for Bald Eagles along the rivers. * Rather than search for worms in the frozen soil, large winter flocks of robins will visit fruit trees for food. * Cedar Waxwings will visit yards in search of fruit, often staying for hours before moving on. * Juncos will hunt for fallen seed, often before dawn. * The smaller the bird, the earlier it hunts for food in the winter darkness. * Listen for Great Horned Owls' "hoot" as they pair up for mating season. * Now through late March is a difficult time for birds; providing food and an open source of water is important. * Winter is a great time to look for birds' nests. Admire the craftsmanship, but leave the nest in place. * Quadrantid Meteor Shower early in the month. See up to 60 falling meteors per hour!